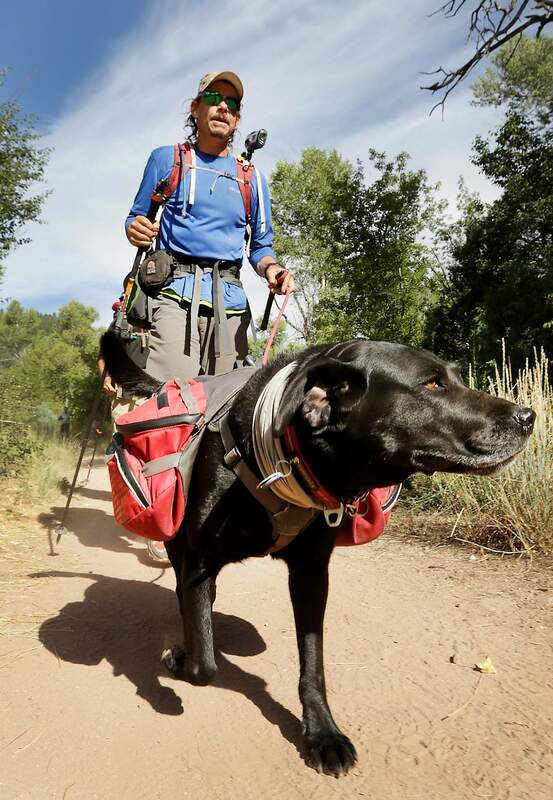 Trevor Thomas and his guide dog, Tennille, come to the end of the Colorado Trail on Thursday north of Durango. Thomas, who is blind, started his nearly 500-mile trek June 19. 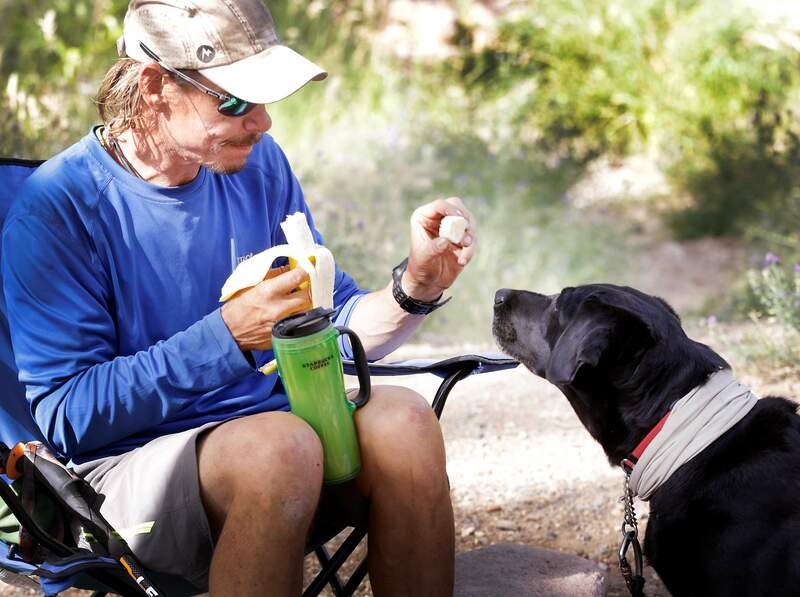 Trevor Thomas gives his guide dog, Tennille, banana and carrots Thursday after completing the Colorado Trail north of Durango. Trevor Thomas, left, and hiking partner Dave Baumgartner enjoy a conversation with other hikers Thursday morning at the end of the Colorado Trail north of Durango. Though he can no longer see vistas, Thomas, who lost his sight to a rare eye disease in 2005, says he enjoys other sensations such as the warm sun. For the duo, the accomplishment was one of many treks they have completed since Thomas lost his sight and started hiking professionally. “I always deemed hiking to be too tame of a sport,” said Thomas, who is from Charlotte, N.C.
Before Thomas, now 46, lost his sight to an incurable eye disease in 2005, he was more interested in extreme sports, such as skydiving, backcountry skiing and racing Porsches. But he became inspired to start hiking while buying poles to replace his walking stick. The salesman told him of torrential rainstorms and bear attacks he faced on a hiking trip, and Thomas, with a sense of adventure, was sold. “From the start of my hiking, I wanted true independence,” he said. In 2008, he finished the Appalachian Trail, which is about 2,180 miles from Georgia to Maine, then he was approached by a sponsor who wanted to support his adventures in exchange for promotion. Since then, additional sponsors have allowed Thomas to continue professionally. While he can’t see the vistas, he enjoys other sensations, such as the warm sun, that many don’t appreciate because they are relying so heavily on sight. “My memories and my impressions of things are more robust,” he said. His attention to sound has also gotten more acute by necessity. For example, he can gauge a room’s dimensions based on echoes. Outside, it’s a little harder, but it’s still possible to locate things, such as trees, by their sound, he said. Tennille, his 4-year-old lab, has also been key to keeping him on the path and alive along 6,000 miles of trails over the last few years. She enjoys a place in the tent, her own sleeping bag and her own air mattress while they are on the trail. Thomas also takes good care of the pads on her feet, which have turned thick after so many miles. Thomas’ sense of space is so sharp that when Ned Sterne, another Colorado Trail hiker, crossed paths with him and Thomas’ friend, Dave Baumgartner, Sterne had no idea Thomas was blind. “My first impression was, ‘There go two guys, walking really fast,’” Sterne said. 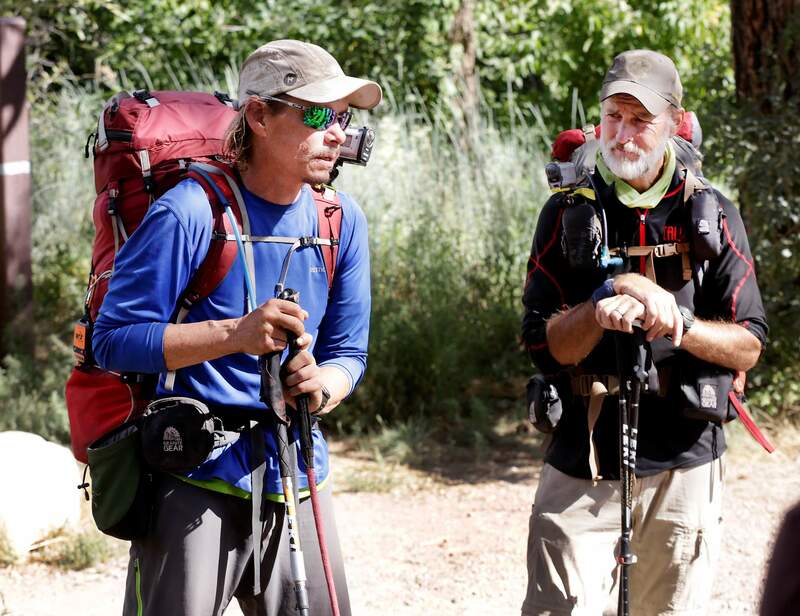 Thomas, Baumgartner and Tennille averaged about 13.4 miles a day on their journey, which started June 19 on the third segment of the trail in the Pike National Forest. Flooding closed the first two tail segments, so Thomas hiked to the seventh segment in the White River National Forest before running into too much snow to continue. That allowed him to finish the first two segments, while waiting for snow to clear. They also faced harsh weather along the way, but the trail itself was well-maintained. “This is truly a world-class trail,” he said. He reached the end about 12 pounds lighter, hungry for breakfast burritos and bacon cheeseburgers.